Legend or fact? In the early 1800s, a strange iron ship with crystal windows drifted ashore off the coasts of the Hitachi province, modern day Ibaraki prefecture, where it was found by locals. By most accounts, inside was a mysterious woman with pale, pink skin and white-frosted red hair. She spoke an unknown language and clutched a square box made of some pale material, which she would not release. Unsure of what to do, the locals packed her back in her ship and pushed her back to sea. It would seem to be a fairy tale, but the same woman and the same mysterious ship has been recorded drifting to shore in different locations, and the various accounts match each other almost exactly. Ufologists have co-opted the story claiming it is evidence of an early UFO siting, although this is extremely dubious. 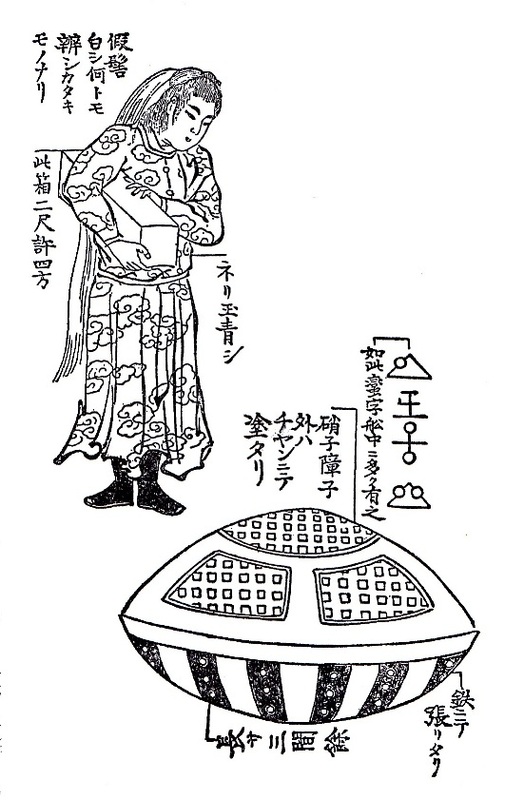 After all, the “F” in UFO stands for “Flying,” and that is something the Utsuro Bune definitely did not do. It is strictly a boat. Other’s claim it is some form of early submarine, or an attempt at a new technology for ocean-going vessels. 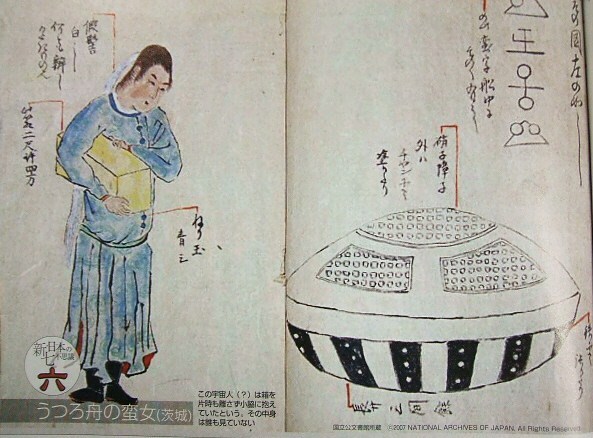 Whatever the Utsuro Bune was, it remains a unique entry in Japan’s weird history. What Does Utsuro Bune Mean? In defining Utsuro Bune, the “bune” part is easy. 舟 (bune) means “boat,” plain and simple. “Utsuro” presents more of a challenge. When written, the hiraganaうつろ (utsuro) is used almost exclusively, giving no clue as to the exact definition. There are a few different meanings that could be attached. The most common translation is “empty” or “hollow.” Another reading is “quiver” like a quiver for arrows. Another, obscure usage of utsuro describes the hollowed-out tree trunk of a sacred tree. There is some speculation that “utsuro bune” originally described a hollowed-out tree trunk into which a sacrificial victim was stuffed and then put out to sea; although there is very little evidence for this other than the name. The most well-known account—and the most detailed—comes from Kyokutei Bakin and his book Toen Shōsetsu (兎園小説; Stories from the Rabbit Garden). Kyokutei lived in the late Edo period. He was what was called a bunkajin, meaning an intellectual, a cultured man of letters. Kyokutei was brimming with curiosity, and like many in the Edo period had a passion for the supernatural and the weird. He hosted a monthly gather of knowledge-seekers such as himself, called the Toenkai, Meeting of the Rabbit Garden. Kyokutei and his fellow bunkajin would gather to swap tales and share interesting or weird stories they had heard—something like what we would call a Writer’s Circle in the modern parlance. The Rabbit Gardern knew all of the best weird tales of the day. They swapped first-hand accounts of yōkai and yūrei and urban legends, anything with the ting of the occult. 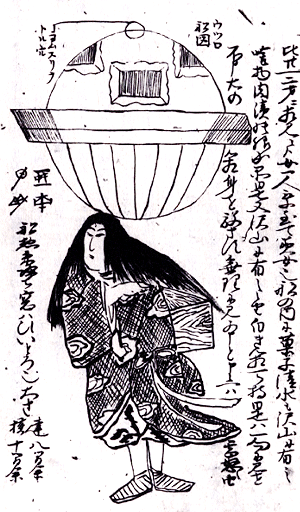 The Utsuro Bune was a type of tale was called a michi tono sogu (未知との遭遇, eye-witness account). They chose the best of these stories and Kyokutei edited them and compiled them into the Toen Shōsetsu collection. Several of Japan’s famous weird tales come from that edition. Kyokutei’s account of the Urotsu Bune is unusual for being so specific, even though it was written 22 years after the incident occurred. It is highly possible—and even probably—that one of Kyokutei’s “rabbits” read the account of the Miscellaneous Notes from the Nightingale Inn and decided to fill in the details. The vessel measured about 3.30 meters tall and 5.45 meters wide. It was round as a ball, and resembled a covered incense burner. The top half was made of what looked like red-lacquered rosewood, with windows patterned like folding screens—only with glass panels instead of paper. The whole thing was sealed watertight; with the seams plugged with something like pine pitch. The bottom of the vessel was bound with ribs of metal—possibly bronze or iron. It is speculated that the metal plating protected the boat from impact with sea rocks. Everyone was much amazed when the top swung open, as if hinged by some hidden latch or mechanism. Then the woman appeared. Her face was a pale pink color, and her hair and eyebrows were vivid red. Here hair hung down her back, and had been lengthened with strips of something white, either animal fur or a kind of fabric. The extensions had been covered in white powder, almost like flour. What it was exactly, we have no way of knowing. Her dress was elegant and of strange material, tight at the top and loose at the bottom. The village women were very interested in seeing how she had achieved the effect of her hair and dress, but it remained a mystery. The villagers checked the interior of the mysterious ship, and found two sheets, and two small containers of water (the water supply was insufficient for survival, so the ship must have had some means of generating fresh water). There was some form of baked goods and some kind of meat twisted together like a rope that served as provisions. The villagers had a discussion about what to do with the strange woman and her boat. An elder of the village proposed the idea that perhaps she was a princess of some distant country. Perhaps the princess had been married, but took a commoner as a lover. As punishment, her father the King had her lover’s head chopped off and put into a box, then the princess was placed in this odd vessel and abandoned at sea. After all, he reasoned, you couldn’t directly execute a beloved royal princess. This way her life was in the hands of the gods. The elder said that would explain her devout attachment to the box, and her resistance to relinquishing it or letting anyone look inside. The elder said he had heard of things happing like that before, and he remembered some story of a woman washing ashore in similar circumstances long ago. It was decided that the best thing to do would be to put the girl back into her hollow boat and return her to the sea. It seemed cruel, but the villagers did not want to interfere with the intentions of some foreign state. So they put the girl back in and rowed her back out into the deep sea and set her adrift again, leaving her to her fate. It was also noted that the inside of the hollow boat was covered in strange writing. Some suggested that perhaps it was the writing of Great Britain, or perhaps the girl was some lost princess from the distant country of America. But there was no way to know for sure. Other accounts of the Usturo Bune soon surfaced, each with a slight variation. If you believe all the accounts, the poor girl kept drifting ashore to various spots in Japan, each time only to mercilessly returned to the ocean. It seems no one was willing offer her a helping hand. Hitachi province, Shakehama. An odd boat looking the same as this illustration drifted ashore. Inside was a woman between the ages of 18-20, with a pale complexion, red eyebrows, and hair that matched the red color of her eyebrows. Here teeth were white, and her lips a deep crimson. Here arms were slender, and she could be considered beautiful. She was well-mannered and calm. As you see in the picture, she was carrying a wooden box that seemed to be very important to her. We do not know the contents as she would allow no one to handle the box. She spoke, but not in a language that could be understood by any of those present. We assume she is a foreigner, not only by her strange speech but because her features and coloring are not those of a Japanese or other Asian person. Inside her strange vessel she has some provisions, what looks like baked goods and some meat that has been treated in some manner. But the exact contents are unknown to us. She has a large tea cup. The construction of her ship was also unknown, made of equal parts metal, wood, and some form of ceramics. Inside we could clearly see the writing that is reproduced on this picture. Description of the Boat: It was about 3.3 meters tall, and 5.4 meters wide. The body appeared to be lacquered rosewood bound with iron or bronze. There were windows made of crystal or glass. The woman appeared to be about 18-20 years old. She had a pale complexion, with red hair. There was writing on the left side of the ship, reproduced faithfully. This happened in the spring of the 3rd year of Kyowa (1803), in the vicinity of Haratonohama. A strange vessel drifted ashore. This vessel was shaped like a hollow sphere, looking something like an iron cooking pot. Around the circumference it was edged like the lip of a pot. The top half of the sphere had the appearance of black lacquer, and was covered in windows. The windows looked like shoji paper screens, and were covered in some sort of pitch. The bottom half of the sphere was bound with iron ribs, as protection from rocks. It looked like the high-quality iron that comes from the Western countries. It was 3.60 meters tall and 5.40 meters wide. Inside the strange vessel was a lone woman, who appeared to be about 20 years old. She stood roughly 1.50 meters tall. Here skin was as white as snow, and her long black hair hung down her back like a plume. The beauty of her face was enough to render us all speechless. Her clothes were like nothing we had ever seen before, made of some remarkable and mysterious fabric. She spoke no language that we could understand. She carried a small box, the contents of which are unknown. Under no circumstances would she allow others to hold the box or even get near it. Inside the boat, there were two sheets laid down as some sort of carpeting. They were softer than anything we had ever felt before. For food, she had some sort of baked goods, and some kind of meat. We saw a single drinking bowl like a large tea cup. Everything was patterned with some sort of design, but we could not determine its meaning. Who knows. This is one of those fanciful bits of history where the real story will probably never be known. It is VERY different from other weird tales of the Edo period, by virtue of being so specific in detail and lacking any supernatural element. The Utsuro Bune is a classic case of “the legend has grown in the telling.” Modern legend trippers have taken up the story, added their own details, and twisted the story like a modern game of telephone. 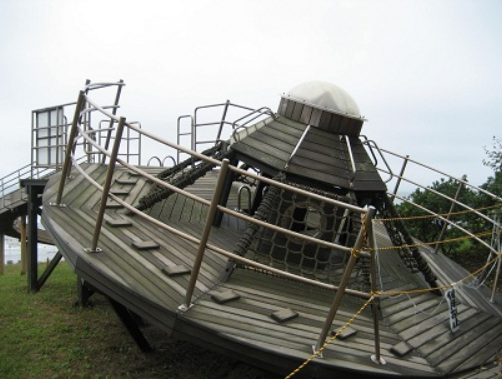 Modern Japan has embraced the legend—and commercialized it like their own Roswell—creating a recreation/play space of the Utsuro Bune at one of the locations where it apparently touched shore. But at the core is always Kyokutei’s original account of a strange woman in a strange boat. And that mystery is good enough without embellishment! I discovered the Utsuro Bune completely by accident, and then became hooked on it. A little too much, I think, because I started researching and translating Utsuro Bune legends when I should have been working on other things! After I have been kept away almost as cruelly myself from reading this great blog a long while (not in the sea luckily..haha). But each time I stop to visit, the story is always the BEST, the eyes popping – the heart racing – the most interesting yet again!! Love- love – love!!!! Zach, what is your theory on this? Honestly I don’t know. The story is VERY different from any other kaidan at the time–both in the odd nature of the event and the detail of the story. I’ve honestly never read anything like it, which makes me inclined to believe it. But what the hollow ship was …. I have no idea. of ningyos, a japanese doll with red hair wearing the strange patterned kimono is now starting to take on an eerie resemblance to Usturo Bune. Your curious and rare japanese stories are more than thought provoking! Thanks for writing this article, the most information I could find this was from Ufology websites, as you can imagine, but they all just rephrased the source instead of directly translating it. 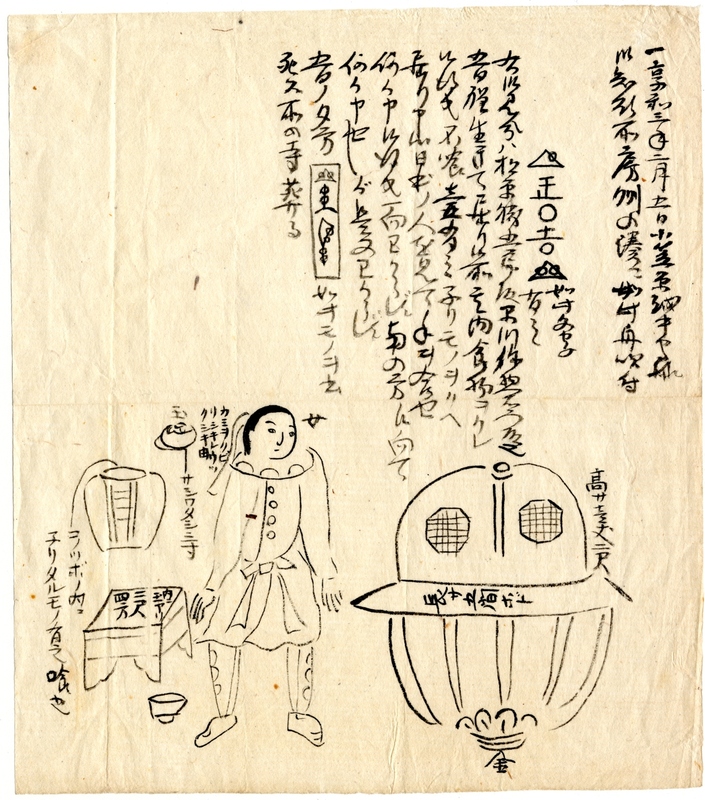 Personally I would say that the Japanese stories that come the closest to UFO mythology are those about Tengu abductions (ever planned to do an article on that?) which are also paralleled by some faerie stories. This story reminds me more of the medieval stories of flying ships (regarding the elements of strange vessels and passangers) or sea bishops (strangers from an unknown society somewhere far out on sea). Of course as many researchers will point out the “modern myth” of UFOs and their pilots is just a transplant of ancient pieces of folklore into the space age. Anyway, seeing some of these details sure is interesting. I think it’s noteworthy that the old man said he had already heard of this specific story that he had provided, maybe indicating an ever older folkloristic origin? One could compare it to poor Danae, mother of Perseus. What is the most puzzling are the construction of the vessel and the writing found in it. I wonder if they even can be compared to any civilization of that time? It sure is an odd story, makes you wish you could have been there to witness it, if it ever happened. Thank you! How interesting that the story made it all the way to Italy! Great work. Is their a translation available of the first account from the nightingale inn? I didn’t see it. People connect this’d to UFOs but this is 19tj century Japan and these are collections of fantasy tales. 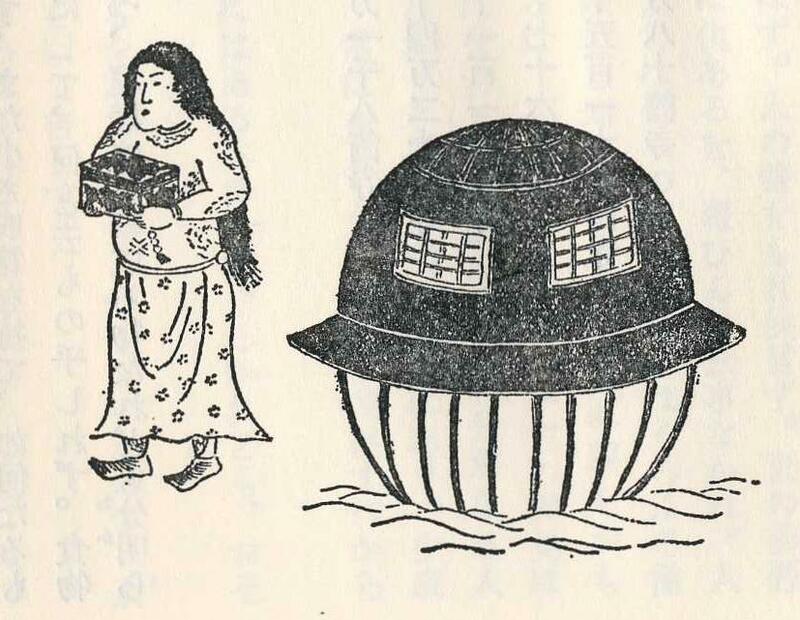 Couldn’t this just be early modern Japanese sci fi?